Background: In single-incision laparoscopic cholecystectomy (SILC), the additional needlescopic instrument was often inserted at right subcostal region to improve the transumbilical manipulability between laparoscope and surgical instruments. We applied 3.3-mm needlescope with a zoom function into the additional port to obtain further improvement in SILC. Materials and methods: Recent 6 months, we performed single-incision needlescopic cholecystectomy (SINC) in 10 patients. Under general anesthesia, 2-cm transumbilical skin incision was made. Lap-protector was applied and covered by glove. Two 5-mm ports and one 2-mm needlescopic instrument were inserted into the peritoneal cavity through the glove. A 3.3-mm needlescope was inserted through the right subcostal needle port. After obtaining the critical view, the cystic artery was divided using laparoscopic coagulating shears and the cystic duct was also divided after clipping. The gallbladder was freed from the liver bed and retrieved through the umbilicus. Results: A 3.3-mm needlescope had a higher quality image than the previous one and equipped a zoom function to realize a precise observation. 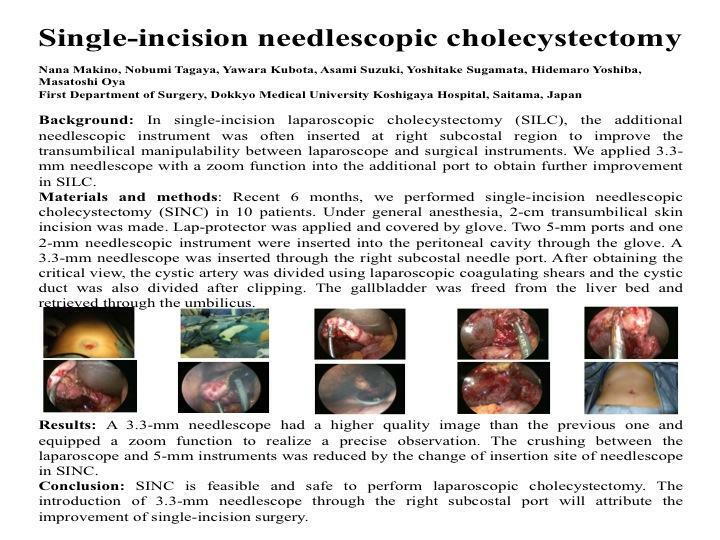 The crushing between the laparoscope and 5-mm instruments was reduced by the change of insertion site of needlescope in SINC. Conclusion: SINC is feasible and safe to perform laparoscopic cholecystectomy. The introduction of 3.3-mm needlescope through the right subcostal port will attribute the improvement of single-incision surgery.